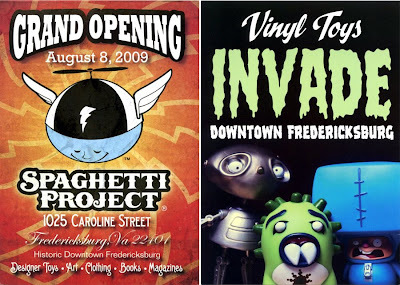 Saturday, August 8 is the grand opening of "Spaghetti Project" (1025 Caroline Street, Fredericksburg). Spaghetti Project will be a store unique to this region in that it carries the stuff that all the kids search out and drop whole paychecks on when they visit New York City:limited edition vinyl toys, exclusive clothing and sneakers, as well as a healthy array of contemporary art books and periodicals which will keep my Christmas List long this year. After meeting with the owners, I had a feeling that their efforts are similar to ours in some respects - they want to share and exhibit all the things that give them their joy and inspiration. Whether it's stemming from hip-hop music to contemporary urban and street art to youth culture and fashion, it's what they love. I'll be exhibiting some of my work in their shop for the upcoming months - and I'm excited to help them usher in a fresh idea to the downtown scene. 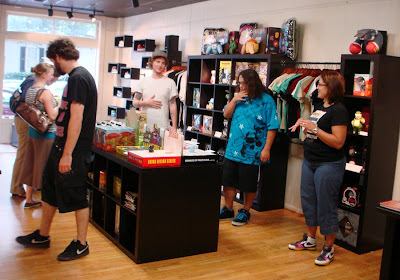 In fact, they'll be open for this month's First Friday Art Walk - so make your way down there and check it out!